G protein coupled receptors play a very important role in the cardiovascular system where they regulate blood pressure and cardiac output in response to hormones such as adrenaline and angiotensin. 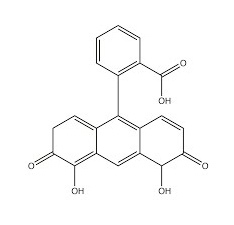 During acute physiological responses these hormones are essential for stress and exercise responses, however; chronic stimulation of these pathways under conditions of cardiac damage due to myocardial infarction (MI) or high blood pressure leads to enlargement of the heart and development of heart failure. We are investigating the molecular pathways in cardiac cells driven by chronic GPCR activation. There are changes in cardiac size and gene expression that can be seen both in whole animals and in isolated cardiac cells. We use genetic knockout animal models, live cell cardiomyocyte microscopic fluorescence imaging, in vitro biochemistry, and cell physiology to understand the detailed mechanisms that underlie GPCR driven cardiac hypertrophy. As a result of some of these studies we have developed novel strategies for treatment of heart failure. In collaboration with other laboratories in the CVC here at Michigan, and elsewhere, we are also studying other roles for GPCR signaling in cardiovascular function. 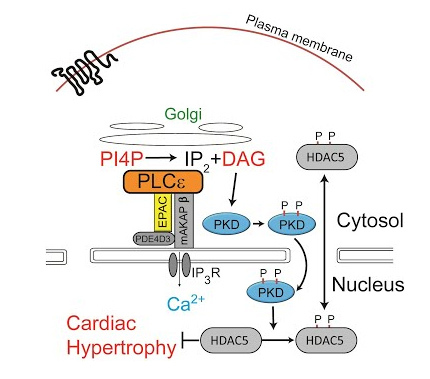 Compartmentalized cyclic nucleotides have opposing effects on regulation of hypertrophic phospholipase Cε signaling in cardiac myocytes. Nash CA, Brown LM, Malik S, Cheng X, Smrcka AV. Phospholipase Cε Modulates Rap1 Activity and the Endothelial Barrier. DiStefano PV, Smrcka AV, Glading AJ. G protein βγ subunits regulate cardiomyocyte hypertrophy through a perinuclear Golgi phosphatidylinositol 4-phosphate hydrolysis pathway. Malik S, deRubio RG, Trembley M, Irannejad R, Wedegaertner PB, Smrcka AV. Regulation of phosphatidylinositol-specific phospholipase C at the nuclear envelope in cardiac myocytes. Simultaneous adrenal and cardiac g-protein-coupled receptor-gβγ inhibition halts heart failure progression. Kamal FA, Mickelsen DM, Wegman KM, Travers JG, Moalem J, Hammes SR, Smrcka AV, Blaxall BC. Phospholipase Cε hydrolyzes perinuclear phosphatidylinositol 4-phosphate to regulate cardiac hypertrophy. Zhang L, Malik S, Pang J, Wang H, Park KM, Yule DI, Blaxall BC, Smrcka AV. Phospholipase C epsilon scaffolds to muscle-specific A kinase anchoring protein (mAKAPbeta) and integrates multiple hypertrophic stimuli in cardiac myocytes. Zhang L, Malik S, Kelley GG, Kapiloff MS, Smrcka AV. Epac and phospholipase Cepsilon regulate Ca2+ release in the heart by activation of protein kinase Cepsilon and calcium-calmodulin kinase II. Oestreich EA, Malik S, Goonasekera SA, Blaxall BC, Kelley GG, Dirksen RT, Smrcka AV. Innate immune cells such as neutrophils or macrophages are recruited to sites of infection to fight off infection or to respond other external insults. The chemical cues that direct immune cell migration to particular locations are called chemoattractants, which interact with and stimulate G protein coupled receptors. The molecular pathways that allow cells to rapidly migrate in specific directions are highly complex. We have been dissecting these pathways with genetic tools, novel chemical tools, live cell imaging and migration analysis. Some long-standing questions are 1) how do GPCRs regulate cell polarity, 2) how do GPCRs regulate cells adhesion and deadesion from the substrate to allow the cells to move, 3) Can we develop reagents to block certain GPCR regulated pathways to inhibit inflammatory responses. Many cells migrate including metastatic cancer cells and chemoattractants also direct migration of these cells. We are also examining how migration of cancer cells is controlled by GPCR signaling. Activated heterotrimeric G protein αi subunits inhibit Rap-dependent cell adhesion and promote cell migration. PLCε1 regulates SDF-1α-induced lymphocyte adhesion and migration to sites of inflammation. Inhibition of G Protein βγ Subunit Signaling Abrogates Nephritis in Lupus-Prone Mice. Rangel-Moreno J, To JY, Owen T, Goldman BI, Smrcka AV, Anolik JH. Dynamic regulation of neutrophil polarity and migration by the heterotrimeric G protein subunits Gαi-GTP and Gβγ. Surve CR, To JY, Malik S, Kim M, Smrcka AV. Sci Signal. 2016 Feb 23;9(416):ra22. A chemical biology approach demonstrates G protein βγ subunits are sufficient to mediate directional neutrophil chemotaxis. Surve CR, Lehmann D, Smrcka AV. J Biol Chem. 2014 Jun 20;289(25):17791-801. 30-40% of the drugs on the market target GPCRs. This is largely because GPCRs have the capacity to bind drugs and regulate a wide range of cellular physiologies. Our laboratory has promoted and developed the idea that targeting the G protein after the GPCR could be a novel and more efficacious strategy for the treatment of various conditions including heart failure, inflammation, pain and cancer. We use high-throughput chemical screening to identify “drug like” inhibitors of G protein βγ subunit signaling. Compounds identified so far have been highly effective in mouse models of pain, inflammation and heart failure. In collaboration with the Center for Chemical Genomics here at Michigan we are performing larger scale high throughput screens for new and better Gβγ inhibitors that will be optimized and tested with the goal of developing novel therapeutic agents for improving the therapeutic efficacy of opioids while avoiding detrimental side effects. This process involves chemistry, biochemistry, cell biology and whole animal studies. Surve CR, Lehmann D, Smrcka AV. J Biol Chem. 2014 Jun 20;289(25):17791-801. Molecular targeting of Gα and Gβγ subunits: a potential approach for cancer therapeutics. Taking the heart failure battle inside the cell: small molecule targeting of Gβγ subunits. Small molecule disruption of G protein beta gamma subunit signaling inhibits neutrophil chemotaxis and inflammation. Lehmann DM, Seneviratne AM, Smrcka AV. Mol Pharmacol. 2008 Feb;73(2):410-8. Differential targeting of Gbetagamma-subunit signaling with small molecules. PLC in cardiac hypertrophy. Using novel genetic mouse knockout models generated in our laboratory we have shown that deletion of PLC signaling in cardiac myocytes protects mice against stress-induced heart failure. We are using new mouse models and AAV vector systems to further dissect these processes in vivo. Cardiomyocyte PLC signaling networks. Using isolated cardiomyocytes we use biochemistry and live cell imaging to map PLC signaling networks that regulate cardiac contraction and growth. PLC signaling in other biologies. With our PLC knockout mice and Crispr cell lines we are in position to examine multiple roles in physiology and disease. PLC biochemistry. We use molecular biology, cell biology and in vitro protein purification to understand the mechanisms that regulate PLC enzymatic activity. Phosphatidylinositol 4-phosphate is a major source of GPCR-stimulated phosphoinositide production. de Rubio RG, Ransom RF, Malik S, Yule DI, Anantharam A, Smrcka AV. Sci Signal. 2018 Sep 11;11(547). G protein βγ subunits directly interact with and activate phospholipase Cϵ. Madukwe JC, Garland-Kuntz EE, Lyon AM, Smrcka AV. Phospholipase C-ε signaling mediates endothelial cell inflammation and barrier disruption in acute lung injury. Bijli KM, Fazal F, Slavin SA, Leonard A, Grose V, Alexander WB, Smrcka AV, Rahman A. Am J Physiol Lung Cell Mol Physiol. 2016 Aug 1;311(2):L517-24. Thrombin promotes sustained signaling and inflammatory gene expression through the CDC25 and Ras-associating domains of phospholipase Cϵ. Dusaban SS, Kunkel MT, Smrcka AV, Brown JH. M3 muscarinic receptor interaction with phospholipase C β3 determines its signaling efficiency. Kan W, Adjobo-Hermans M, Burroughs M, Faibis G, Malik S, Tall GG, Smrcka AV. Phospholipase C epsilon links G protein-coupled receptor activation to inflammatory astrocytic responses. Dusaban SS, Purcell NH, Rockenstein E, Masliah E, Cho MK, Smrcka AV, Brown JH. Epac2-dependent mobilization of intracellular Ca²+ by glucagon-like peptide-1 receptor agonist exendin-4 is disrupted in β-cells of phospholipase C-ε knockout mice. Dzhura I, Chepurny OG, Kelley GG, Leech CA, Roe MW, Dzhura E, Afshari P, Malik S, Rindler MJ, Xu X, Lu Y, Smrcka AV, Holz GG. J Physiol. 2010 Dec 15;588(Pt 24):4871-89.